In 1962 imaginations were sparked, the first experience that could only be produced in a “virtual” environment was created. That of course was the ground breaking Spacewar! on the DEC PDP. The premise of the game was to fly your ship through space and battle your human opponent. Processing speeds limited the ability for an AI opponent, non the less, the first virtual environment was born. Fast forward approximately 25 years and the computing landscape had changed, power previously only found in institutions and business had found it’s way into the home in the form of the Commodore Amiga, Atari ST and Apple Macintosh. Alternate realities inside a computer screen were commonplace, with a little imagination, new experiences were accessible by most. 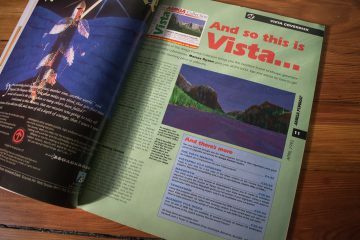 To address the challenges of realism in virtual environments – Game designers, artists, hardware engineers and developers continued to develop new ways of convincing us the silicon realities were real. 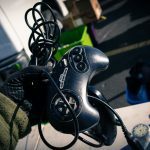 Head mounted displays, haptic feedback and clever programming meet 80’s – 90’s cyberpunk counter culture, fueled by authors like William Gibson in a montage of devices that often caused nausea for it’s users. The ideas and concepts were moving fast, yet still technology couldn’t quite deliver. The upper end of the commercial VR spectrum flourished with companies like SGI, Sense8 and Autodesk. If your department or institution had the budget for high end systems and software, you were fortunate. 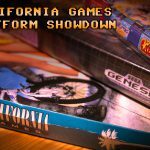 For the home, small business or indie team, other options existed that took advantage of the power delivered by new, low cost systems. One such company was Virtual Reality Laboratories, Inc. Virtual Reality Laboratories, Inc logo had a consistent typeface for their logo but the graphic element varied between products. Incorporated on 17th April 1989, in San Luis Obispo, California, Virtual Reality Laboratories, Inc. (or VRLI) was the brain child of Lance H. Woeltjen, the companies President and his brother, Clint H. Woeltjen who went on to become the VP of Engineering. Mr. Lance Woeltjen’s lifelong interest in outer space and his personal goal: “a broadening of interest in space exploration and astronomy” 1, led him and his brother to form the company with it’s flagship products: Distant Suns and VistaPro. 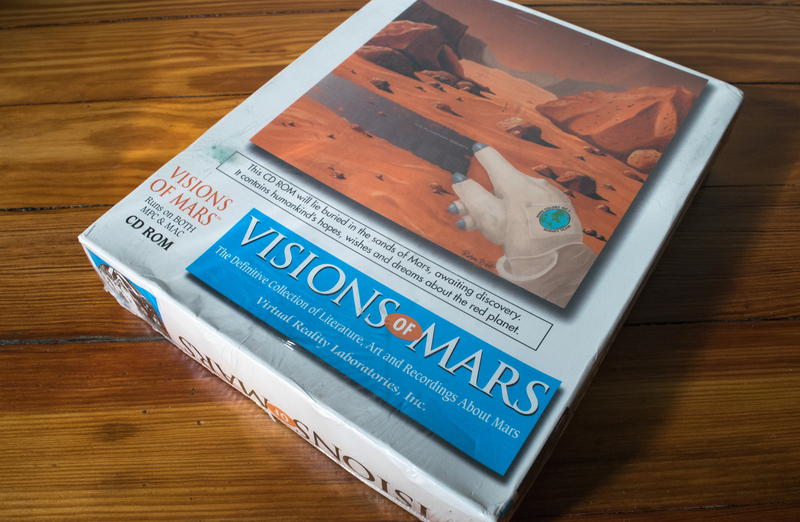 Initially the computing platform of VRLI’s focus was Commodore’s graphically ground breaking Amiga line of computers, whose visual processing ability at the time, was unmatched at the same price point as DOS and Apple Macintosh systems. Although not confirmed, this system preference seems in alignment with the broader target audience in the companies ambitions. 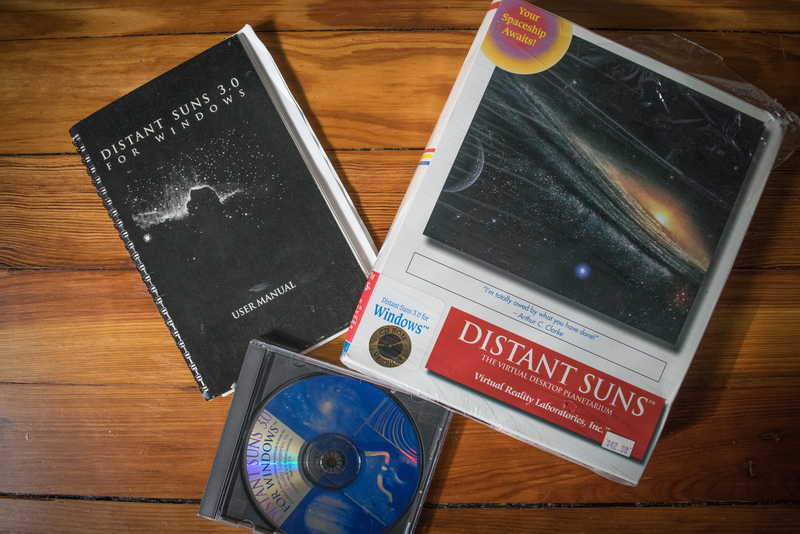 VRLI’s launch title: Distant Suns, provided home computer users an affordable and highly usable desktop planetarium. 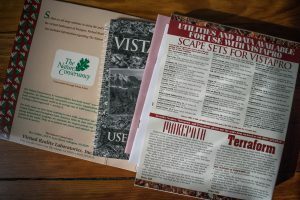 Astronomy programs had existed in abundance for many years before the advent of Distant Suns, but the graphic limitations of personal computers in the early eighties created visual obstacles. Star crowded displays or text overlays were needed to overcome the visual limitations of fixed palette machines. 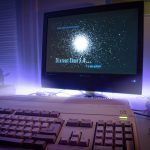 As the author, Mike Smithwick states in an early interview 2: “Having worked in flight simulation graphics we immediately recognized the power that the Amiga brought to the desktop unlike anything else.“ The graphic enhancements introduced to the developer, meant celestial objects in this astronomy program could have 9 varying degrees of brightness. Truly a step forward in computer planetarium display capabilities. Originally released in April, 1987 under the title “DigiSky” and then “Galileo” for the Commodore Amiga 1000. Galileo, continued to be sold until late 1988. In early 1989 when the then current publisher, Infinity went bankrupt, Mr. Smithwick had to find a new means of distribution. In the course of shopping for a new publisher, it was discovered that Infinity had failed to secure the trademark Galileo. The name Distant Suns was born from a Usenet poll and a new publisher was found – Virtual Reality Labs, Inc. Added to the performance garnered from a 512kb Amiga, Distant Suns had a strong sales run and won several awards, these strengths would lead to Commodore using the program in their marketing collateral, touting the capabilities of the Amiga system. Eventually, Distant Suns would be ported over to the Apple Macintosh and Windows 3 operating system, on the Microsoft platform it would become the first astronomy application for Windows. Distant Suns would continue through the restructuring of the new publisher and the evolution of the home computer for the next 20 years until the invention of the smart phone, where it still resides today. A very impressive track record for a program that started life on an Amiga 1000 over 30 years ago. Trying to install Distant Suns 5.0 on a system with a large hard drive(4gb), will result in an error from the installer utility. It will inform you that you have -xxxxxxxxx (negative drive space) and it requires x amount of bytes to continue. To overcome this, open the installer script contained in the “Distant Suns 5.0” executable icon with “ed” in shell. Change the declared space_req variable, located towards the top of the script to reflect the negative amount of space reported by the installer and save. 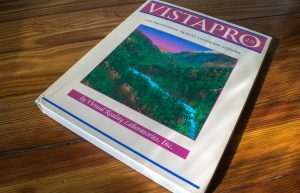 Shortly after the release of VRLI’s flagship product, the publisher teamed with the developers of HyperCube Engineering – John Hinkley and Brick Eksten to release VistaPro. 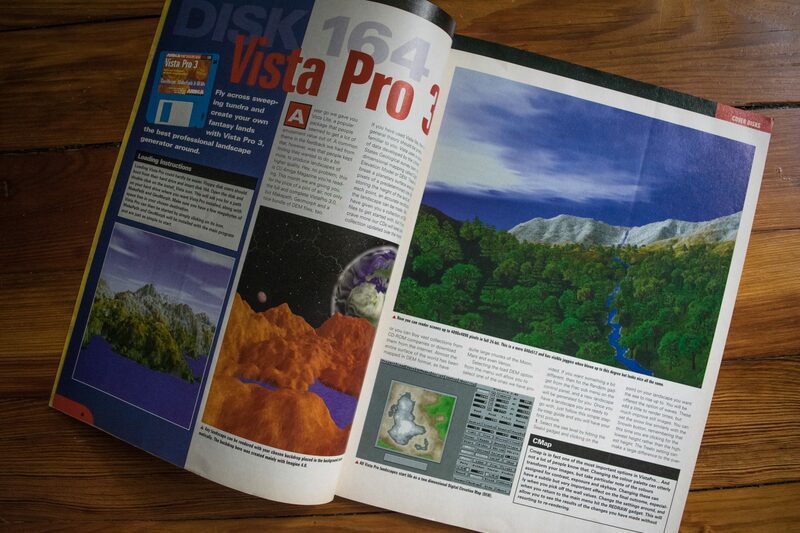 Vista and VistaPro were landscape generators and animators that used fractals to produce 3d scenes. The first version of Vista, v1.2, was released on the Amiga in 1990 (reviewed by Amiga Format issue 15, released on cover disk, AF issue 33) and subsequent versions were renamed VistaPro (v1.0 – 1991, v2.02 – 1992, v3.0 – 1993). 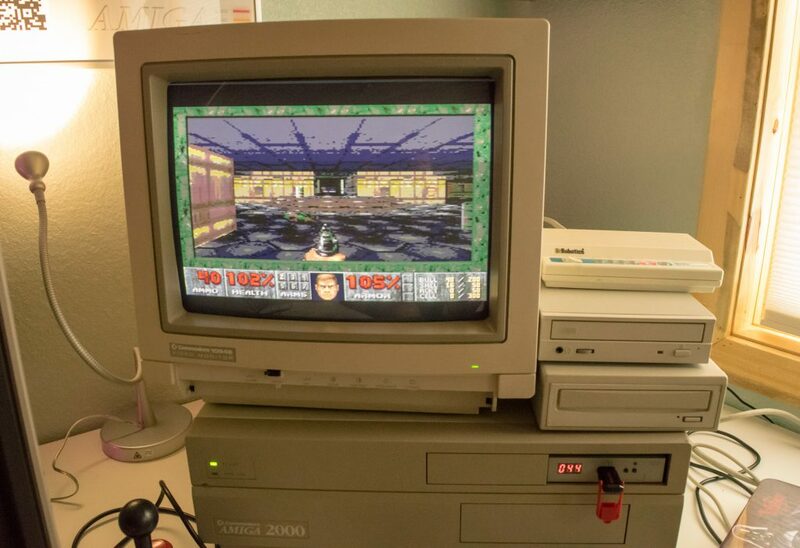 Early versions of the program were able to run on 1mb 68000 Amiga’s, although the scenes produced would notoriously take hours for a single frame. Later versions that appeared as the renamed VistaPro, were well known for their lofty system requirements – 3mb and a ‘020 processor, at minimum. VistaPro was intended as an artists package, an application that was capable of producing stunning landscapes from randomly generated numbers or from USGS DEM (Digital Elevation Model) files. Not only was data for North America and famous natural landmarks included, but also data for regions and canyons on Mars, collected by NASA spacecraft. A gift of the software from the developer, John Hinkley led Arthur C. Clarke to favor the application in the writing of “The Snows of Olympus”. Later, the author flew one of the developers to his house in Sri-Lanka to assist him in the setup and running of the program (comp.sys.amiga.advocacy). Vistapro inspired artists, writers and hobbyists alike. As easy as it was to produce vivid scenes on relatively inexpensive hardware, the software also found it’s way into academic and government use. Field offices of the U.S Dept. Of Agriculture and the U.S. Geological Survey employed VistaPro to create models and visual guides from collected data. Within the USGS, a notable example spawned from VistaPro, a spin off application – Kolor-Map (Adel A.R. Zohdy) 3, a utility intended to produce single and multi frame animations of maps and cross-section map data. 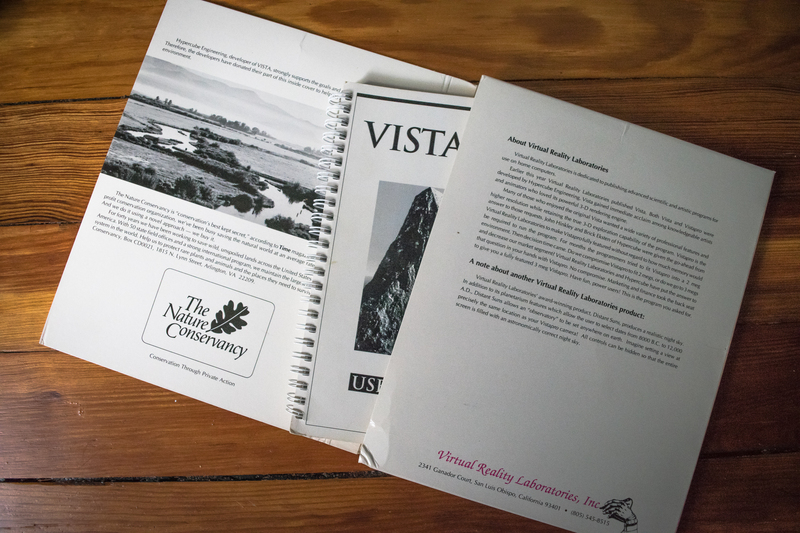 Reading through Mr. Zohdy’s documentation, one notices – with developer admiration, how Virtual Reality Labs were open to share their technology with organizations that were putting VRLI’s software to scientific use. VistaPro’s success on the Commodore Amiga was quickly followed up by it’s DOS release, v1.01 in 1992 and v3.0 in 1994. It wasn’t until 1994 that a 3.0 release for Microsoft Windows 3.1 became available, support for Windows ’95 came to fruition in 1997 with version v4.04 4. The final version, VistaPro Renderer, v4.2 entered the market in 2005. On the Macintosh side, VRLI commenced support with a System 7 version (VistaPro v1.08) in 1992 5. Later versions, v3.0 came in 2001 and v4.0 in 2002, these iterations were both released by MonkeyByte 6. An OS X version commenced development in 2004 and a functional version was made available to beta testers, it is unclear however if the program was released to the public 7. MakePath – a utility that loads a VistaPro DEM file and produces an animation script. The user manipulates selectable settings for control of the vehicles speed and bank (jet plane, glider, dune buggy, motorcycle, helicopter and cruise missile). The flight path is manually drawn by the user. The script is loaded back into VistaPro to render each individual frame and the results are compiled into an animation. Terraform – addresses one of the main limitations of VistaPro, the ability to edit the peaks and valley’s in the scene. GeoMorph – used to generate values required to produce an animation of an evolving landscape. Lyap2DEM – for creating DEM models from Lyapunov mathematical equations. 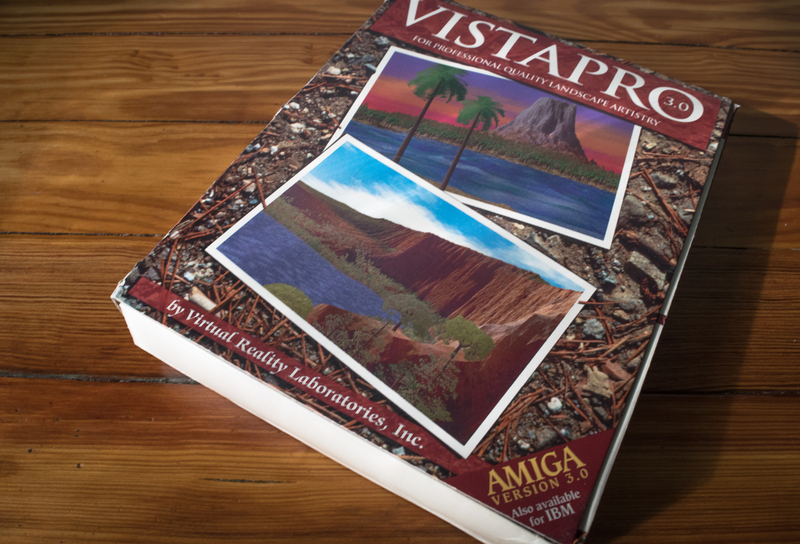 Vistapro 3.0 (windows and Amiga) made the further advancement of introducing the ability to produce stereoscopic images for use with virtual reality headsets. Stereo images were an early, rudimentary method to create an image that was interpreted by the eye as 3d. By rapidly flickering one side of the same image to each eye, the brain is fooled into thinking the image contains depth. It was a small modification to the software package, but one that gave some credibility to the inference of the publishers name. The PC rise was cutting into the Amiga’s graphical advantage by the early 90’s and VRLI shifted accordingly with the market. No longer was primary development focused on the Commodore machine. Coincidentally, the mid 90’s were financially a difficult time for VRLI. The publisher continued to release their cd-rom educational titles: Visions of Mars and Mars Explorer, both excellent examples of providing quality content in the age of the emerging cd-rom market. VRLI had a black sheep amongst it’s catalog of products, FormWizard; an application for Windows 3.1/95 PCs that allowed users to scan and import documents into their machine, complete the form electronically, then print or fax the document back. The only obvious reason VRLI would step into this market was to diversify their product line up, a business move that would prove to buy some time for the other software titles they carried. By the beginning of 1996, things were looking dire and unsustainable for VRLI. 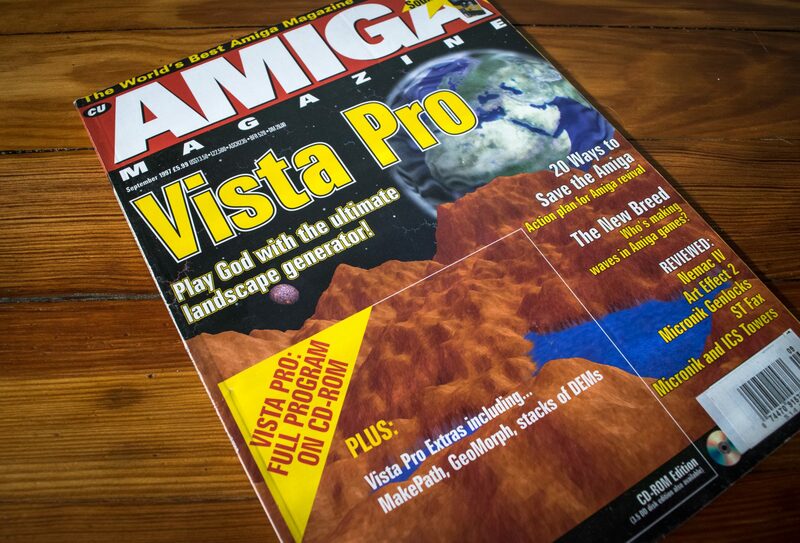 Sales of Distant Suns were down and the Amiga market had dried up. On April 8th, 1996, RomTech Inc. a company from Langhorne, Pennsylvania, agreed to purchase the majority stock of VRLI for a total of $10.4 million 8. RomTech’s typical range of products included: CD-ROM based clip art libraries, productivity tools and educational titles targeted towards the small business market and budget home user. The primary outlet for these products was large chain stores (Target, Walmart, Best Buy). Their interest in VRLI was down to one title, FormWizard. 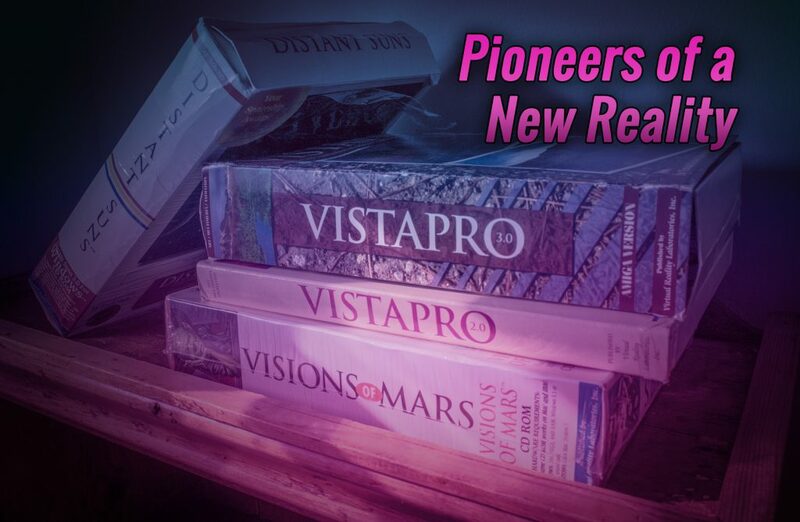 While VRLI continued to operate on the west coast and support the Windows versions of Visions of Mars, VistaPro (Windows) and Distant Suns (also Windows), their core catalog fell into neglect. A section of the Amiga market remained loyal after the collapse of Commodore in 1994. The loyalists stayed hopeful that one of the numerous buyers of Commodores intellectual property would revive the platform, some developers at Virtual Reality Labs shared this optimism. Clint H. Woeltjen, one of the companies founding members, splintered off to form his own development shop called Chaocity. 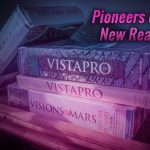 This new companies focus was to maintain, support and port over to the Amiga, new releases of Distant Suns: First Light and Vistapro. 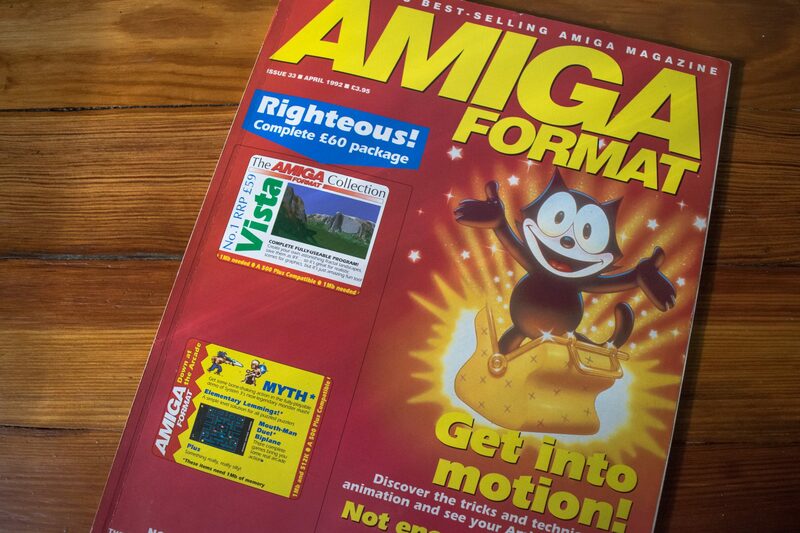 Like a lot of other die hard Amiga users in the late 90’s, the desire was there but the failed promises of the Amiga’s new owner(s) eroded the Amiga into an obscure, fringe platform. Development of new commercial titles wasn’t financially viable. VistaPro 3.10 for the Amiga didn’t reach a release and Distant Suns: First Light was also abandoned. Distant Suns for Windows continued to be developed for a few more years with an outfit called MonkeyByte, a software development house comprised of former VRLI developers. Retirement of DS finally came with the release of Windows Vista, but DS eventually returned, now on the mobile platform, where it still maintained and developed. RomTec eventually changed their name to eGames, Inc. in 1999 and committed to focusing on PC games. In a curious twist of Amiga lore, the new owners of VistaPro, went on to purchase Cinemaware, Inc on October 6th, 2005 9. Cinemaware, of course were the publishers of Defender of the Crown, It Came From the Desert and Rocket Ranger to name a few, all famous Amiga titles from the earliest days of the machine. It seems history, did a full circle on itself. All opinions expressed in this article are solely of the authors and are in no way endorsed.